HEATHER COMPLETES SPARTATHLON WITH PODIUM FINISH. 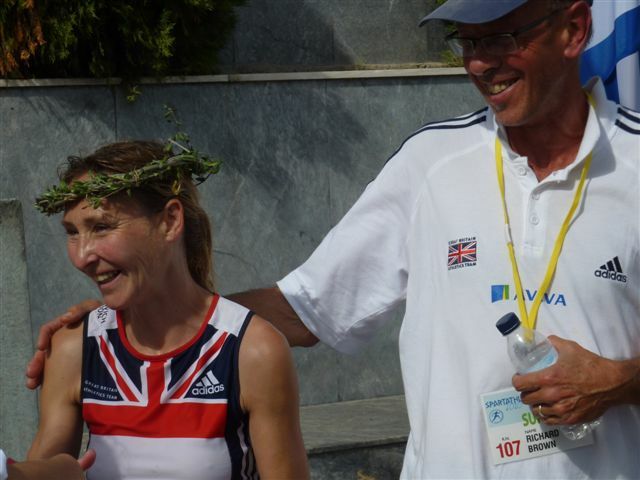 Fri 24th at 07:00 September, saw 351 Endurance Athletes from 32 different countries including Honiton's Heather Foundling-Hawker at the start line in Athens for the 2010 Spartathlon Race. A 153 mile race that that follows the same route taken by the hero of Ancient Greece, Phidippides who ran 153 miles from Athens to Sparta to get reinforcements in the battle of Marathon over 2500 years ago. A very strict entry criteria is required to be able to take part in the race known as Spartathlon and this is was a Challenge that Heather had dreamed of completing. Described as the world's most gruelling race, the Spartathlon runs over rough tracks and muddy paths (often it rains during the race) which it did for Heather, crosses vineyards and olive groves, climbs steep hillsides and, most challenging of all, takes the runners on the 1,200 meter ascent and descent of Mount Parthenio in the dead of night. This is the mountain, coveredwith rocks and bushes, on which it is said Pheidippides met the god Pan. In 2,500 years man has had no impact at all. There is still no pathway over the mountain that is swept by strong winds and low temperatures. The weather was not kind to the Athletes with Temperatures reaching 34 degrees on Friday with high humidity and Heavy rain after Midnight when Heather was running over Mount Parthenio in complete darkness with only her head torch for guidance. Heather fell and slipped several times on the loose rocks and suffered a cracked bone in her shoulder and also suffered from sickness whilst descending the mountain. To finish the race from here would be a remarkable achievement as Heather still had 60 miles of running to go. Finish the Race Heather did though in an amazing 34th Place and 3rd Lady, completing the 153 miles on Saturday afternoon having run for 32hrs and 43 minutes with no rest or sleep. Out of the 351 Athletes that started the race only 128 completed the race with 223 unable to complete the challenge which lives up it status as one of the worlds gruelling challenges. To achieve a Podium Place at this race is a Great Honour and achievement. Heather has been suffering from a catalogue of injuries and just getting to the start line was a challenge but as one highly UK Coach said Heather is quite simply a phenomenal athlete.